Last week I attended this very interesting event by Panasonic Malaysia. 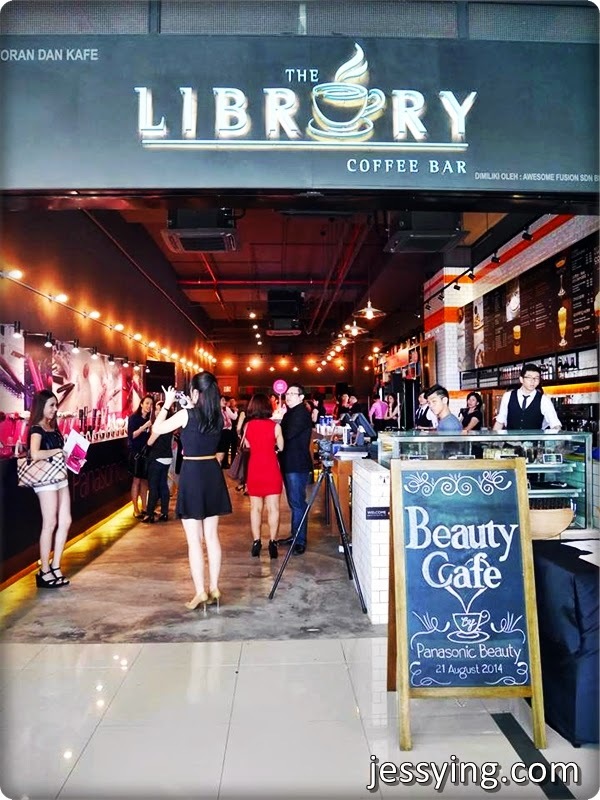 The invitation stated Panasonic Beauty Cafe and at first I was wondering what is that all about - is it a cafe where we can beautify ourselves while sipping our favourite cup of coffee? I knew this concept existed in Korea where you can get a makeover if you purchase a drink from the cafe. Interesting huh! Well I arrived at the event and found that Panasonic Beauty showcased their latest range of beauty and grooming products. Not the usual way of set up of just displaying the products only for you to see and take pictures... I will tell you more about it! In case you don't know, Panasonic brand used to be called as National and was found in Japan 1925. However about 10 years ago it was rebrand as Panasonic. They offer products from digital camera/camcorders, digital audio visual, kitchen applicants, home applicants, lighting products, communications, battery, accessories and beauty & health gadgets too! In fact Panasonic has been a premier manufacturer of quality beauty products since 1937! Mr. Yosuke Matsunaga, Managing Director of Panasonic Malaysia Sdn. Bhd said Panasonic Beauty is designed for the active & busy Asian women on the go. Easy-to-use and Convenience is what they had in mind. He said that "The Panasonic Beauty Range is especially suitable for contemporary working women who constantly need to look their best. Achieving the best look at the shortest time is what we need to provide". Mr Yosuke shared that although Panasonic Beauty products mainly focus on women, but there are men grooming products too! 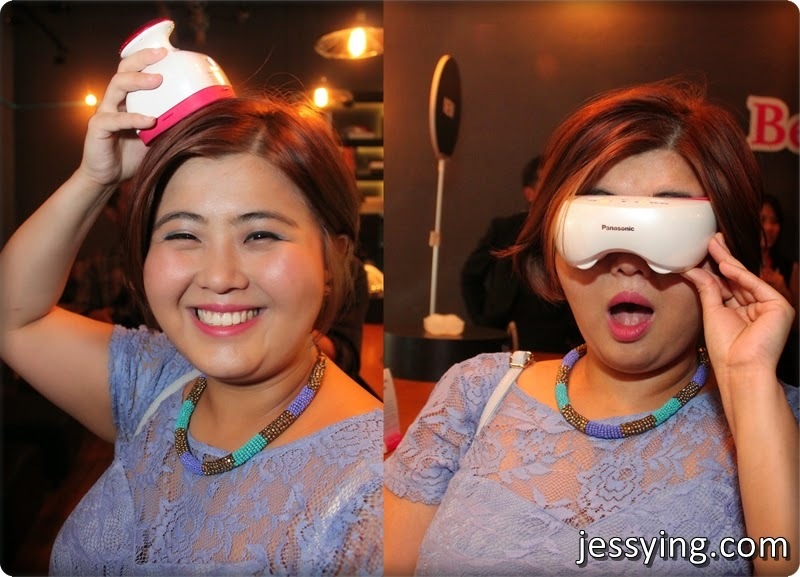 Believe it or not I'm a beauty gadgets geek and always on the look to try out new gadgets! In fact I owned a few of Panasonic beauty gadgets! At the event, Beauty Cafe by Panasonic Beauty provides 4 different stations for hands-on demonstrations for us to try out the products personally. There are a wide range of hairstyle being offered by Panasonic Beauty. Maybe some of you might ask what so unique about it ? This new Nanoe™ Hair Dryer from Panasonic can dry your hair without drying it out. So how does our nanoe™ technology work? 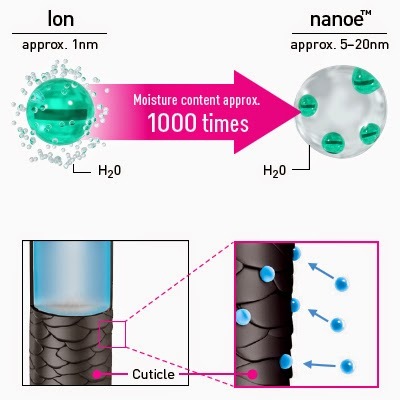 The Secret of nanoe™ Technology takes naturally occurring ions present in the air and breaks them down into significantly smaller particles that are then combined and held together by water molecules. These new moisture-rich nanoe™ particles—with nearly 1,000 times more moisture than regular ions—are infused into the hair and scalp during the drying process. In essence, the nanoe™ Hair Dryer helps protect and beautify your hair by taking the moisture that's on the outside and putting it on the inside. The result? Smoother, shinier and stronger hair while helping to strengthen and protect it against damage from heat and brushing. For styling and touch-ups, some of these hairdryer comes with smart attachments that help you accelerate drying, add volume and minimize frizz. The versatile nanoe Hair Dryer is the ultimate drying and styling tool for beautiful, healthy looking hair. I was lucky to have Sebastian Tan, a Professional Hair Stylist and Art Director to style up my hair using the latest Panasonic EH-ND62 hairdryer! Cool & Gentle : To maintain hairstyles longer. Oh no wonder sometimes my hairstyle does not set properly because I was using the wrong wind setting at home ! This hairdryer also comes with a portable diffuser that helps to emits warm air which reaches right down to the roots. It would be ideal for styling and drying permed or naturally curly hair, and for lifting the roots. I felt my hair instantly feel smoother and looks a little more shiner after it! And guess what Panasonic EH-ND62VP hairdryer is only selling at only RM129. In fact I am already a user of Panasonic Nanao Hairdryer for years. I have a compact one in white/purple colour and I'm still using it till today because I can feel it helps to keep my hair soft & healthy! Besides nanoe hairdryer, Panasonic also offers hair styling products such as straightener and multi-straightener (where you can use it to straighten or curl your hair!) with nanoe technology too! 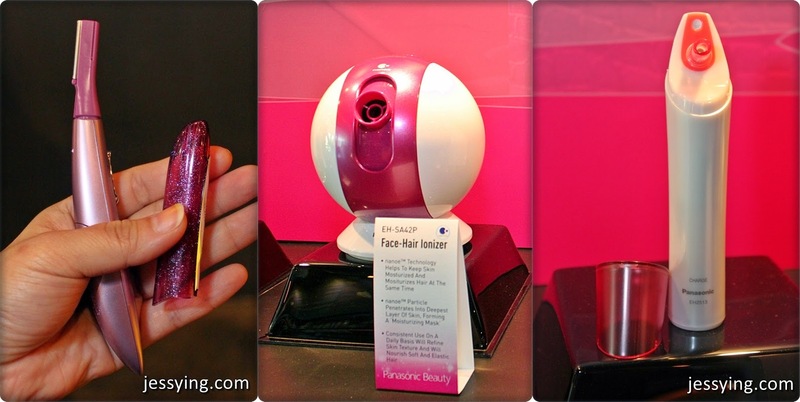 And if you insist of having pink beauty gadgets, yes they do have pink ones for you! Next stop Face Care Station. In most of the facial spa salon we visited, the therapist will usually use a gigantic looking steamer to open up our pores before cleansing or extraction. Now with Nano Facial Steamer EH-SA31VP we can enjoy relaxing, spa-quality facials at home with nano steam. Love how it's really small & nice looking and does not take up a lot space on our table. As all of you know, as we age our skin loses the ability to retain water hence we have this dry skin problem and sagging problem. The Facial Ionic Steamer uses ultra-fine nano-sized particle steam, which is 4,000 times finer than normal steam to penetrate the skin and and effectively supplement moisture. Refresh - Ultra-fine nano-sized particle steam penetrates, leaving the skin feeling refreshed and renewed. Cleanse - Nano-sized particle ionic steam is released to encourage deep pore cleansing. Cleansing with the facial ionic steamer will result in the removal of makeup, dirt and excess oil. The water tank has two steam therapy options: Full tank (about 50ml) lasts approximately 6 minutes and Half tank aprox. 3 minutes. It's recommended to use purified water instead of normal tap water. Now instead of rubbing and pulling your skin while removing makeup, I think this Nano Facial Steamer will help to remove makeup gently by melting the makeup first before we wash it off. Definitely we will not have clog pores problem anymore since the pores would be opened while steaming and we can wash it off thoroughly after that! I notice that some of my waterproof makeup stated that can be removed using warm water, so I think I can now steam & melt the makeup with th nano-sized particle steam. I also discovered that this also can work as hair steamer! Just apply hair treatment cream on your hair before steaming it with this! Can save money from visiting salon for treatment salon already! Just remembered to keep a safe distance from the steamer opening so that you don't burn your face or hair. Portable Women's Facial Trimmer ES2113PC (RM89) - with flexible pivoting head to shave small area like eyebrow and upper lips. Portable Pore Cleanser (RM179) - deep & effective cleansing through suction method especially on nose areas. When we talked about Body care gadget definitely the first thing we think about is epilators or shaver! You know we woman want to look smooth not only on the face but everywhere else lah so this is a must have device for all women out there! It has 2 speed for easy controlling and LED Light which helps to illuminates skin to detect unwanted hairs that may have been missed. For a gentler epilation experience, use it wet by adding gel or soap on the disc before you turn it on. The gel/soap will begin to foam and you can slide the head smoothly along the skin to remove the unwanted hair. If you are in the hurry, you always can use it dry directly on the skin. The Panasonic also offers an extensive on-the-go tools that you can easily keep in your keep in your handbag! Very easy to use and it's operated by battery.. so no hassle of needing to bring charger along! I have this one in orange colour and has been using it to wash my teeth since last year. This Panasonic Portable Toothrbush removes plague more effectively than hand brushing using sonic vibrations that create 16,000 brush stroke per minute. Although the brush is a little small but it allow me to move around my mouth easily to brush my teeth and I love how the vibration is pretty gentle compare to other brands. This is 100% waterproof. If you are not a fan of those manual eyelash curler, this is for you. I knew that a few of my friends swear by this curler and told me that this gives a more beautiful & long curling effect than the usual curler. This 360 degree heated, rotating comb moved forward and backward while curling and separating our lashes without pinching or crimping it. Something very unique, no need any special technique to use like our usual curler and I shall go and try it out soon next time at the store without mascara! This is a compact electric travel shaver. Perfect for quick touch-ups (dry use only). Pivoting dual-action blade with adjustable shaving head can flip and lock into vertical position. Perfect for fine detailing on tough-to-reach spots. This nail care set allows us to have salon-quality nail care achieved easily at anywhere! Quick & easy solution for a beautiful & natural glossy nail! I have many nails care products but none are works like this! It comes with 4 different attachments for different functions - Filing, Cuticle Care, and 2 Polishing. I have tried this at the Beauty Cafe and seriously this is freaking awesome because my nails are smooth and shinny! Seriously I have spent so much money to buy so many nail care buffering products but none works as fast & precise like this! And if my bf asked me to file his nail, I would just pass this over and tell him, please DIY... no need special skill required and definitely you will not cut yourself! And I definitely need to get this Panasonic Nail Care set already! What is more exciting when we are the first in Malaysian to see the new products that would be soon be available in Malaysia!!! From Scalp Massager, Eye Warming Massager Therma Estheic Roller, Oral Irigator and Recharger Toothbrush.. I have a few favourite and I want to "curi curi" take them home... But that's illegal.. so cannot lah! I really love the scalp massager & eye massager so so nice as if someone is massaging my head & eyes like that! Can't wait for them to be available in Malaysia! And yes I think I will be more beautiful than you after my visit to the Panasonic Beauty Cafe! Come to think of it, nowadays with beauty gadgets with such high technology we actually do not need to step out of the house to visit beauty salons to beautify and pamper ourselves when all these gadgets can allows us to have salon like treatment back at the comfort of our own home. And yes no more hassle of making appointment, stuck in the jam and looking for parking! From the above, which are your favourite Panasonic Beauty Gadget ? Let me know in comment box and I might be reviewing them just for you!